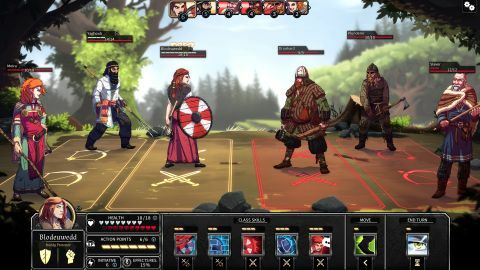 Dead in Vinland combines resource management, RPG combat, uneven writing, and a lot of diciness into something I couldn't stop playing until I finished it. What is it? A turn-based survival game with Vikings. Vinland was the corner of North America settled by Vikings in roughly 1,000 AD, probably in what's now Newfoundland. That bit of history isn't super relevant to Dead in Vinland, which is actually set on a mysterious island that attracts shipwrecks from all over the world, though it's definitely North American. It looks a lot like L'anse aux Meadows, has raccoons that the shipwrecked survivors mistake for wild cats, and even has tomatoes, which weren't brought to Europe until centuries later. Dead in Vinland isn't history, though. It's a turn-based survival game about a Viking family on a magic island that is also inhabited by god-like blue people, a tribe led by a skull-collecting warlord named Bjorn, and wanderers from other lands, including Africa and Japan. CCCP previously made Dead in Bermuda, which was basically a dry-run for Dead in Vinland, minus Vikings. There's something of The Sims in Dead in Vinland in that it's all about balancing people's needs. My band of survivors gets hungry and thirsty each night, so I make sure to gather food and water during the day. I also upgrade the camp, explore the island, and try not to work people to death. Every job has negative effects—sending someone hunting makes them fatigued, costs three arrows, and has a chance they'll come back with an injury as well as a pile of raw meat and pelts. On the plus side nobody has to be told to go to the toilet or clean themselves, and they only need food and water once a day. Sometimes they're not even thirsty when it's time to hand out drinks, which is a relief after playing survival games where I need to consume constantly or be dead by lunchtime. None of these people are great at the things I've assigned them too, oh well. The main thing that sets Dead in Vinland apart from most other survival games is that it's turn-based. I assign everyone a job each morning, hit the end turn button, see how it plays out, then repeat in the afternoon. At night they gather round the fire and chat, the family of four I start with arguing some nights and bonding others, while slowly getting to know the other survivors who join the camp. Characters have a depression stat that goes up no matter what they do, and can only consistently be lowered by building a tavern. I say slowly because sometimes conversations bottleneck, like when the Persian merchant kept introducing himself to people one at a time a week after moving in. At least there's no language barrier. One of the magic things the island does is let everyone understand each other, and while I'm OK with that being represented as slangy modern English complete with words like "dumbass", the line about "the Sheep Whisperer" and the Hitchhiker's Guide to the Galaxy reference felt out of place. At least there are no Monty Python quotes. That makes it sound silly, and sometimes it is, but Dead in Vinland is also frequently bleak. Characters have a depression stat that goes up no matter what they do, and can only consistently be lowered by building a tavern. (It's just a bench, stools, and a homebrew kit but it does the job, even though it really ought to worsen the problem.) And then there's Bjorn's warriors, who demand weekly tribute and attack explorers on sight. Combat is inspired by Darkest Dungeon in that ranks are important and when characters attack they slide across the foreground to bash each other. Each side lines up in two columns so characters like the berserker can stand at the front with fragile archers and witches at the back. Abilities like taunting and pushing let each side mess with the other's line-up, making for interesting tactical possibilities, though once you get used to them you'll fall into a rhythm of repeating the effective combos. Darkest Dungeon players will feel at home. Although exploring can trigger combat, uncovering more of the island is essential because it's the only way to find pick-a-path events that parcel out useful supplies such as the tinder mushrooms that are the only way to light a new fire. Some of these events advance competing storylines in which you deal with Bjorn and another, mystical threat. All of them come down to dice rolls, which are guaranteed to infuriate. I've got a high tolerance for randomness in games, and when I miss a point-blank shot in XCOM or fumble the ball in Blood Bowl I usually just laugh. Dead in Vinland presents me with a series of stat checks to climb a tree or harpoon a sea monster and when a character fails they take a hit to their stats and then I just have to try again, and again. It quickly stops being as funny as missing a sectoid with a shotgun from five inches away. Then there's the other kinds of randomness, like the random weather that can sometimes result in three days of rain leaving all the meat on the drying rack rotten and everyone on the verge of suicide. Or the insult duel where I have to choose from three responses even though I can only see the first few words of each. The insult duel isn't great. It might sound like I'm pretty down on Dead in Vinland, not just for the randomness but for its patchy writing and the way combat becomes routine. But the reason those flaws stand out is because what's between them is so good. When I put my archer in an exposed position to give her the best odds of a critical hit and she drops an enemy with a single arrow it's thrilling, and when a romance plays out back at camp between the witch and the merchant it's deliberately awkward in a way that's sweet and funny. Given the era, we'll forgive the "my lady". The main thing that makes me forgive Dead in Vinland its faults is the tightrope teeter it walks between catastrophe and salvation. Everything constantly hovers on the brink of disaster, but there's always a way clear if only things go right. I need six more lumber to pay off Bjorn, but I've only got one morning left to gather it and my best forester chops a random amount each half-day. It might not be enough, and the only other way to find more wood is to loot it from opponents. I tell my explorer not to use stealth when she sets out and hope she finds trouble. Wondering which Norse god is the equivalent of RNGesus, I press the end-turn button again. When I've got 10 plates spinning—or exploring, hunting, and crafting improved water barrels as the case may be—I want to keep them spinning, no matter how bad the wobble gets. I want to check on all of them, stabilize what I can, and then step back to see what thing that's out of my control is going to screw it all up next. That's what Dead in Vinland gets right.